So what’s this “Tommyville” crap? It was the late 70’s and I was just becoming a teenager. My parents went out a lot on Saturday nights and I just happened to have a 13-inch black-and-white TV in my bedroom. Back then, of course there were only three channels (ABC, NBC, CBS) and then we had this thing called UHF (I have no idea what that stood for) which we could seek out one or two fuzzy local channels. On Saturday night I’d check out The Love Boat on ABC which was a show based on a cruise ship in which people would “hook up” and fall in love at sea. I always dreamed of the fun I could have on a ship like that. If that wasn’t a great enough picture, The Love Boat was immediately followed by Fantasy Island. This was a show about a group of people who would fly into this “fantasy” island resort, where they could live out their fantasies, no matter how crazy, and have their dreams come true. Incidentally, I never thought this strange until now that I’m typing it! If the thought of spending a week on a Love Boat wasn’t enough of a fantasy for a 13-year-old boy, then the idea of taking a vacation to a tropical island and having your every heart’s desire come true was enough to fill Saturday nights for a few years, anyway. I watched every episode. And it sunk in. 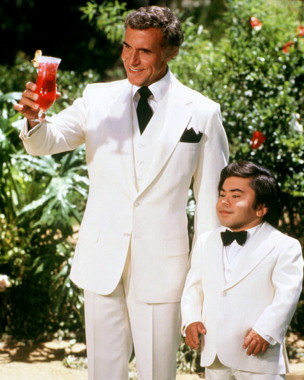 Years later, as an adult, I was introduced to a real-life Fantasy Island when I showed up at a network marketing opportunity meeting. It was my first introduction to people actually talking about fame and fortune and riches and dreams coming true. I was in my tenth year working as a sportswriter and I can assure you that nobody in that building (except the owner) ever talked about things like that. Looking back, I don’t think anybody there ever even thought about things like that. But I did. I’ve always been a deep thinker, and those words played over and over in my mind. Was it really possible to design a life that you’d never need to “escape” from? Most of us know the feeling of stepping off a plane and into the first day of a special vacation. What would it be like to wake up with that feeling every day? I figured, why not me? So that fateful day, I went to work on it. I made it my mission to design my perfect life. I had already married my perfect wife. I then designed and built “my perfect” home in the woods of Connecticut with a long driveway, a huge back deck, and a pool off to the left. I surpassed my newspaper income with my network marketing income and left the “employee” world behind. And, most importantly, I discovered that I had the power to control my personal thoughts. In fact, I’ve learned that it’s the ONLY thing we control in this world. So I decided to be happy. Sounds simple, huh? I love it here. I do whatever I want here. It’s a cross between Tommy Bahama and Margaritaville. It’s my “happy place.” I can close my eyes, hear island music, and feel the sun shining on my face. Yes, even when it’s January and 5-degrees outside (like right now). We all posses the ability to create and live on our own personal Fantasy Island. You can call it whatever you like. I’ve heard it said that every person’s dream is “the pursuit of happiness.” Not the actual happiness, but the “pursuit.” This tells me that we all need to have dreams and goals. We need to be moving toward something. We need to want to wake up tomorrow for something. You don’t have to be rich, and you don’t have to want to be rich. The secret is to be grateful for what we have, and be moving toward what we desire. Tommyville isn’t some egomaniacal nonsense that I’ve invented to be clever. It’s my real place of residence and I take it with me wherever I go. We all live in our own little worlds. I don’t know what it’s like to live in your world, and you don’t know what it’s like to live in mine. But I’d love nothing more than to encourage you to pack up your belongings, book your trip, and step out of the plane and into “(your name here)ville.” Try it sometime. Can we come join you in Tommyville?